Weaving is my passion. 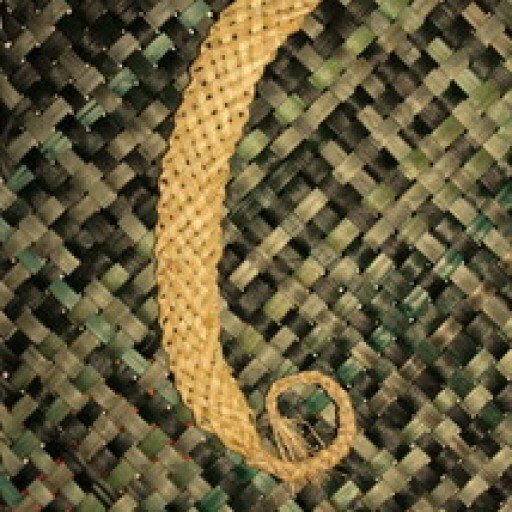 I have been weaving for about 14 years both with harakeke (phormium tenax – NZ flax) and similar natural fibres, and wool. My work is largely influenced by nature, especially the beautiful, rugged West Coast of New Zealand’s South Island,where I live in Kaniere near Hokitika, and the bush which surrounds my home and studio. Sometimes I even create in the outdoors such as on Hokitika beach in the annual Driftwood and Sand event and in my garden. I love working with harakeke. It has endless possibilities both in technique and form. I use it both natural and dyed. The variations that can be obtained in its natural state in colour and pattern can be stunning, and recently I have become excited about the use of colour by dyeing the fibre. 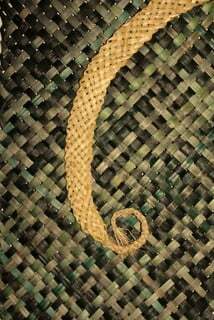 I have expanded from weaving small containers and the more traditional kete, including patterned kete whakairo, into art pieces such as wall hangings and three dimensional work. 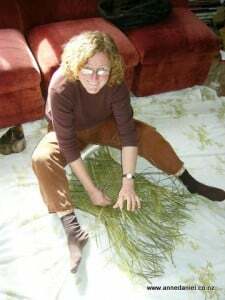 I am continually looking at new ways of using the fibre, which I harvest from bushes of cultivars from the National Collection growing in my garden. I also weave on a loom and am looking at exploring ways of combining both areas of my weaving life.